I work in wool fleece fibers and embellishments. I chose craters for the expressed purpose of exploring the concept of doing the moon in some type of felt design. When I was researching, I discovered the NASA images from the Lunar Orbiter. To determine the depth of a crater, the images are shown in rainbow colors! That gave me artistic license to illustrate the moon’s craters in multi colors. I used a fantastic background fabric that I purchased from Spoonflower Fabrics. 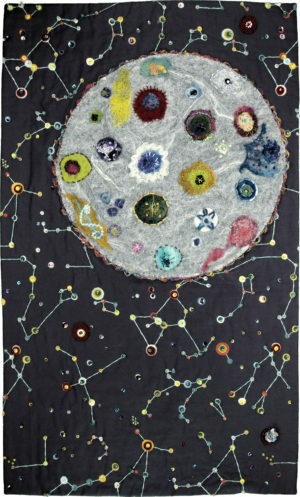 The fabric carries the “crayola” color of the craters to the constellations and stars. I felted the wool, embellished with hand stitching, and beads. Wool wet and needle felting, hand embroidery, sewn beads, sewn sequins. Wool fleece, netting, threads, beads, sequins.